Maybe we should call this "partially rebuilding the raft we built last night," because we came out this morning and realized that we'd used nails instead of screws on a part of the deck where we really need screws, so Noel spent most of our functional working time today pulling out nails and replacing them with screws. 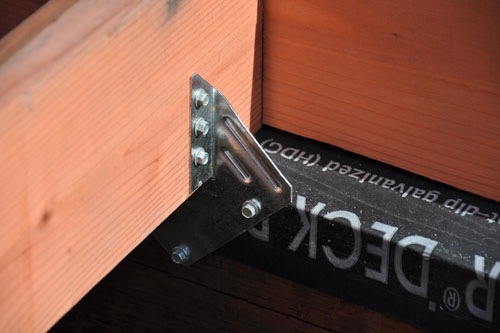 In particular we needed to have them on the ties that attach the raft to the beams, because at some point in the future we will need to replace the water tank, and to do that we will want to be able to jack up the whole deck surface. As it happens, the screws go a lot faster than hand-nailing each individual nail in the connectors. And considerably faster than pulling out a few dozen small nails by hand. 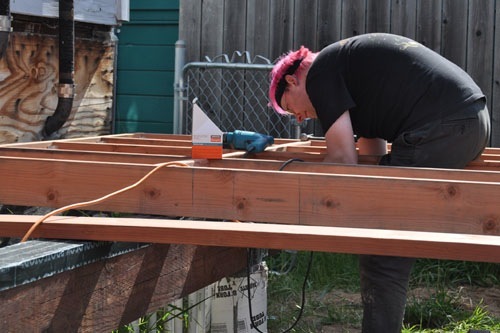 Because about the time we'd gotten all the joists we had screwed down to the beam and replaced the nails we'd done with screws, we noticed that we'd attached the wrong piece of wood to one end of the joists, so we had to back that out and put the right piece in, as well. The rest of the work time we had was spent figuring out just how big to frame the opening for the water tank lid. We're going to frame an opening and make a small hatch so we an get into the top of the tank, should that be necessary. 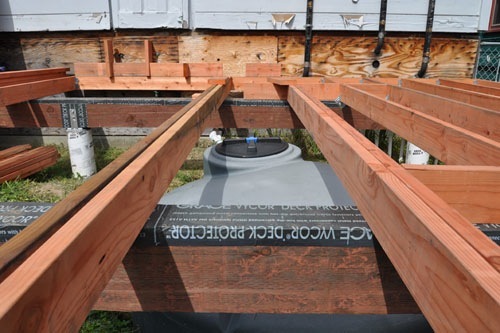 We also know that our deck width does not divide evenly by 16 inches (the joists are spaced 16 inches on center), so we thought we might be able to lose that small weird joist bay in the framing around the tank. And it works out very well indeed. You can see in this picture that we used some blocks for between the joists to measure out our bays from the other side of the deck, so the last bays will all be even. Then we placed the joists roughly in the opening to see where they would fall, mostly to accommodate my lack of good stereo vision which makes lining things up by eye difficult. It works out just about perfectly, almost as if we had planned it carefully to fit that way. I should note that the location of the tank is largely random, though we knew it needed to be a certain distance from the house and oriented so the two plumbed openings were facing the house. Other than that it would be been perfectly possible for the tank to be eight inches to the left in this photo and thus not nearly as neatly lined up. Luck was with us there, at least, even if we totally messed up the carpentry last night. But then Noel had to take off up North to play music, and I had some other projects I needed to work on, so that was as far as we got today. Your deck lay-out and decking material look wonderful! As usual, the two of you build everything with the utmost of care and detail. I have one question however -- before you attach the deck boards to the joists, are you planning to cover the grass up under the deck with landscape cloth and then add gravel or some other stone covering? We have a deck that is about 18-24" off the ground and despite being told that nothing would grow under there, weeds took over. So, about a year after we had it built, we covered the area under the deck and added a stone layer -- now, no more weeds trying to make their way through the deck boards! I'm planning to weed it out and put down mulch. I don't find the landscape fabric and stones combination works very well for keeping down weeds, especially when the chickens will still be able to get under there and kick things around. But it will be high enough that I can do that after we've finished building the deck. The tank in the middle takes up most of the space that would be really tough to get to. I also have a weeds under the deck problem. Heck some are beginner trees. My Mom owned the house before me, and had had landscape fabric and gravel put in place. Unless you're young and agile, which you guys seem to currently be, this is an awkward thing to fix periodically. Maybe the chickens will do all the weeding? As it happens, our gardeners are even younger and more agile than we are, so we're just not that worried.